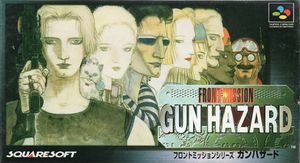 Set in 2064, the story of Front Mission Series: Gun Hazard takes place all over the world in an alternate Front Mission universe. In the early 21st century, nations around the world fought over the control of natural resources. With natural resources dwindling in supply, the nations of the world eventually banded together to seek a solution to the growing crisis. Realizing the potential in space-based energy, they began development of an orbital elevator known as "Atlas" in 2024. As the orbital elevator's completion drew near, a breakthrough was achieved in miniature fusion reactors. The countries responsible for Atlas began to halt development of the orbital elevator and pursued miniature fusion reactor technology. Left unfinished, Atlas became a symbol of failed dreams and hopes as the world regressed back into a world of conflicts. The graph below charts the compatibility with Front Mission Series: Gun Hazard since Dolphin's 2.0 release, listing revisions only where a compatibility change occurred. This page was last edited on 3 December 2017, at 16:18.